Do you process information quickly or let it pile up? Do you have piles of paper on your desk and piles of files in your computer? 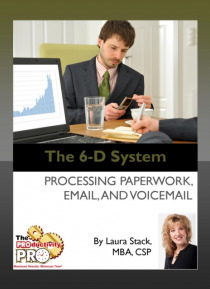 Bestselling author Laura Stack, The Productivity Pro(R), will use her proprietary 6-D System to show you how to manage information. You'll learn to quickly move paper, email, calls, and information through your system as soon as it crosses your desk. You'll learn t… o: Move information through your system quickly Assign and track tasks for others Take three-minute actions on items Specify a date and "e;tickle"e; an item to complete it later File information so you can find it quickly Prevent the information from coming across your desk in the first place Information can become a time leach, but Laura's 6-D System will help you handle it quickly and increase your productivity. After listening to this program, you'll know what to do with any piece of information that enters your world from now on.